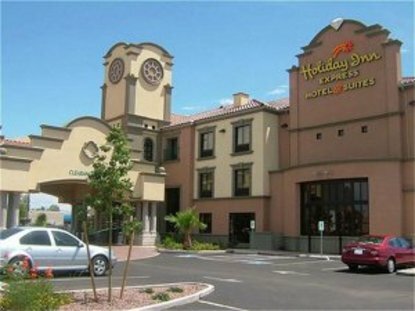 Welcome to the Holiday Inn Express Hotel & Suites Tucson Mall. We are a new, all suites hotel. * 100% NON SMOKING * The perfect choice for business or leisure travel We are conveniently located next to Tucson Mall in North Tucson, as well as the Tucson Heart Hospital and The University Of Arizona. Experience the incredible beauty and serenity of the area as well as the many attractions that are only minutes away. Enjoy your stay in one of our 105 beautifully appointed suites. Wake up to the smell of coffee and complimentary breakfast bar. Work out in our cardio exercise room or take a plunge in the heated pool. If relaxing is more your style, try lounging on the sun deck or in a warm soothing spa. From the breath taking views to the attentive hotel staff, the Holiday Inn Express Hotel & Suites is the perfect choice in Tucson. El Tour De Tucson November 2007. This hotel is committed to providing accessible facilities under the American Disabilities Act. If your accessibility needs are not met, please contact the Hotel Manager on Duty. Should you require additional information regarding accessible facilities for guests with disabilities, please call 1-800-Holiday (U.S. and Canada) or contact the hotel directly. For the hearing impaired, TDD service is available at 1-800-238-5544 within the U.S. and Canada.